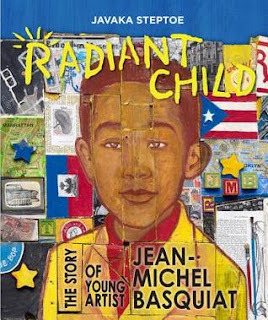 Javaka Steptoe pays tribute to the late artist, Jean-Michel Basquiat, in the picture book biography Radiant Child. Steptoe uses mixed-media collage on scrap wood found on the streets of New York for the illustrations inspired by Basquiat's art. The story begins with a young Jean-Michel who lived with his parents in Brooklyn and dreamed of being an artist. Influenced by his mother's interest in poetry and art and his father's interest in music, Jean-Michel drew, painted and created in a non-traditional style that wasn't clean and neat. Readers will be interested in Jean-Michel's street art he spray painted at night under the name, "Samoo." The story ends on a positive note with Basquiat reaching his dream of becoming a famous artist. The narrative text and intricate collages create a portrait of a complex and talented artist who influenced many artists who came after him. Take time to read the author's note and back matter containing more information about the life and untimely death of Basquiat. Steptoe explains how he uses motifs and symbolism from Basquiat's work including crowns, eyes, and vehicles. 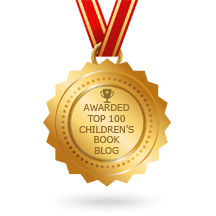 Radiant Child will not only introduce young readers to an artist they may not know, but it will also inspire children to dream, create and make art. 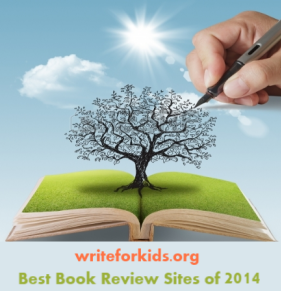 Look for Radiant Child during the awards season; it's sure to top many lists! Picking this up at the library this week--can't wait to read it! New to me. Thanks for the review! The illustrations are absolutely stunning. Gorgeous stuff!